If the Runner installs Bug Out Bag with Career Fair, how many power counters are placed on it? Lowering the install cost of Bug Out Bag has no effect on the value of X. The number of counters placed on Bug Out Bag is always equal to the number of credits actually paid to install it. How many tags must the Runner have for the Corp to use Best Defense to trash a Bug Out Bag with 5 power counters on it? The number of tags the Runner has does not matter for playing Best Defense to trash Bug Out Bag. The Value of X is only set during the time at which it is paid. Once installed, the cost of Bug Out Bag is assumed to be 0. 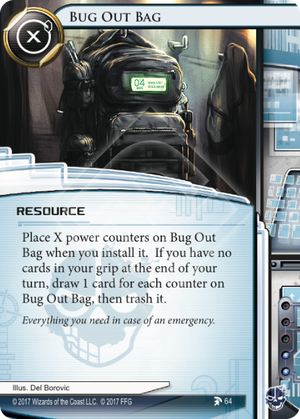 If the Runner has two Bug Out Bags installed, will both copies trigger at the end of the Runner's turn? Yes. The condition for the Runner to have no cards in their grip is part of the ability's trigger condition, so it is checked at the end of the turn instead of when the ability resolves. If the Runner uses Fall Guy to prevent Bug Out Bag from trashing itself, do they still draw cards? Yes. Trashing Bug Out Bag is part of the effect of the ability not a cost or condition. So, let me get this straight... Nothing on the card says anything about removing counters. So if you prevent the trash, you can just keep it and use it again. You could load it with, like, 7+ counters, and use it alongside 3 Fall Guys as a janky semi-permanent draw engine. Load it once and you can end 4 turns with no cards in hand to draw 7+ cards and be good for the next turn or two. That's a lot of draw. Enough, actually, to draw most of your deck and be considered your main draw engine. As long as your deck has a consistent way of getting rid of spare cards before the end of the turn, like for example Faust, Bookmark, Severnius Stim Implant, The Noble Path or maybe some self-damage tricks. Another interesting synergy is Safety First. At the end of the turn, it's checked if your grip is empty. If it is, both Safety and BOB trigger simultaneously. The runner simply chooses to resolve Safety first (pun intended), gaining 1 card and then still gaining X cards from BOB despite his hand not being empty anymore, because it was empty when the end-of-turn triggered. So the runner ends up with X+1 cards in grip. That might actually do some good work in an Adam deck that burns cards fast. Bug Out Bag (BOB for friends) is one of those cards that looks worse at a glance than it is. The important thing to know is that per "Timing structure of turns" the end of turn is after the discard phase. That means that if BOB triggers any cards you gain are not subject to the hand size discard rule until the end of your next turn. Thus if you have 4 cards in your hand when you steal Obokata Protocol and you know there's a Ronin ready to strike you needn't fear if you have a well filled BOB. BOB even helps stay on the The Noble Path. Liberate yourself from fear of Jinteki and run fearlessly. The Noble Path is by the way an excellent way to trigger BOB if you feel a BOOM! heading in your direction. The biggest downside of BOB is that the bag only triggers at the end of your turn and only if you don't have any cards left. That lack of flexibility can be a bit of a pain. Here's to hoping this BOB has a better future than that other BOB. *The right answer is dead, they just may not know it yet. This smells like it would fit well in a lot of those Severnius Stim Implant combo decks which I've seen floating around. Build up with Theophilius or Duggar's or whatever, pop this at end of turn for whatever ludicrous money you want, and get ready to do it again next turn.